How do you spend most of your time? When you’re not working or spending time with your family and friends, what keeps you busy? Can you say for certain that you are making the most of every single day? If you’re reluctant to say yes, something clearly needs to change. 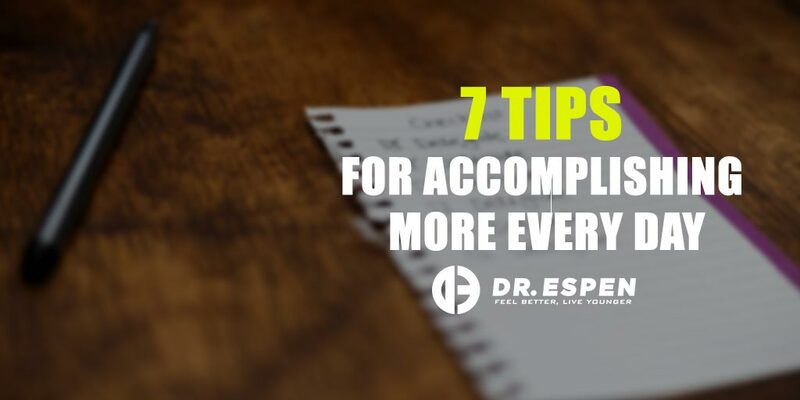 Here are seven simple steps you can take to do more each day and start living your life to the fullest. Be an early riser. Make sure your sleeping habits don’t hinder you from doing the things you love and achieving your daily goals. If they are, go ahead and change them. Imagine all the things you could do if you woke up an hour or two earlier than you usually do. Make time for exercise. It’s no secret that people who stick to a regular workout regimen are healthier, happier and calmer than those who don’t. Their excellent health makes them better equipped to face daily challenges and do more each day. Maintain a balanced diet. Everything we put in our bodies has a direct impact on our life. If your diet consists of calorie-dense but low-nutrition foods, you won’t have the energy to achieve your simplest daily goals. Your meals and snacks should be filled with essential macro- and micronutrients. These 5 tips for eating healthy should help you achieve that. Do big tasks first. Take a good look at your schedule for the day. What’s your biggest, most time-consuming task? That’s what you should do first. Getting it out of the way at the start of your day will help you put enough focus on the smaller tasks and get more things done. Pursue what you love. What is your true passion? What are the dreams, hopes, ambitions, and goals that inspire you? Always make time for those, and don’t hesitate to engage in activities that put a smile on your face every single day. Get plenty of rest. Don’t underestimate what a good night’s sleep can do for you. If you often find yourself tired, unmotivated or uninspired due to sleep-deprivation, change your sleeping schedule. Don’t feel guilty about it – your body and mind need at least seven hours of sleep each day to function at their peak. Be there for others. Do a good turn every day. Lending a helping hand will always give you a lasting sense of fulfillment that can empower you mentally and physically to achieve more each day. When your friends, family, and colleagues are facing tough times, do your best to be there for them. Remember to nurture your mind, heart, and soul. Cherish everything that makes you who you are and continue seeking ways for you to flourish every day. Avoid anything that invites negativity, and embrace everything that brings positivity into your life.